It’s comfy, its cutting edge, its snug. 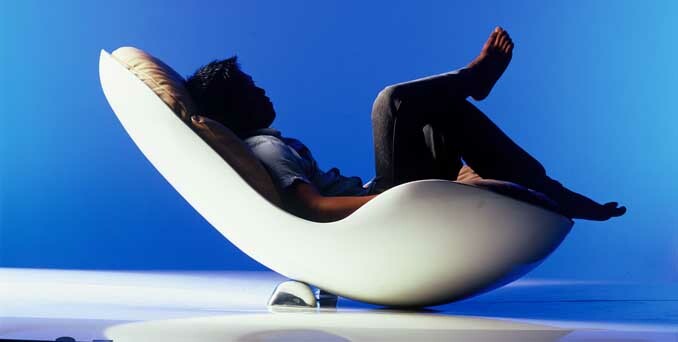 Young, up and coming Australian designer, Alvin Tjitrowirjo has designed what appears to be the ultimate lounging chair. Featured in the 2005 Milan Furniture Fair and again at Design X in Melbourne this year, the Snug chair offers it’s occupant the freedom to position the entire body in any way it sees fit whilst constantly and comfortably accommodating it. With it’s retro form design the chair is more than asimple piece of furniture it is a relaxation pod for those who appreciate beautiful form , fluid lines and enticing aesthetics. The Snug chair base is made from molded fiberglass with aniline leather upholstery. It’s aluminum polished stopper can be removed to metamorphisize the chair into a rocker. Brilliant, simple, beautiful.